The seventh cranial nerve affects sensation across a broad area of the face – pressure on that nerve can cause the painful condition called hemifacial spasm. Hemifacial spasm, also known as tic convulsif, is a condition that causes frequent “tics,” or muscle spasms, on one side of the face. These tics are usually not painful, although they can be uncomfortable, and they are usually not life-threatening. But they are distressing to the patient, and as the condition worsens the tics can become more and more frequent and intrusive. Hemifacial spasm can affect both men and women, but it is most common in middle-aged and older women; its incidence is also higher among Asian people. Hemifacial spasm is a neuromuscular disorder — meaning that the source of the disorder is a nerve, but the manifestation is the tic, which is a muscular contraction. Patients often first notice an intermittent twitching of the eyelid muscle, which may pull the eye shut. As the disorder progresses, patients may report spasms in the muscles of the lower face, which may cause the mouth to be pulled to one side. If left untreated, hemifacial spasm may ultimately affect all the muscles on one side of the face, in an almost continuous state of contraction. Hemifacial spasm typically occurs on only one side of the face (hemi- meaning half), but in some cases both sides of the face are involved. 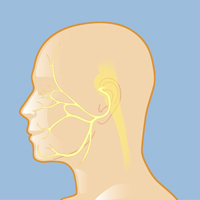 Like trigeminal neuralgia, hemifacial spasm is caused by any one of a number of possible irritants to a facial nerve. Trigeminal neuralgia is a disorder of the fifth cranial nerve, while hemifacial spasm is centered on the seventh cranial nerve. Hemifacial spasm is most commonly caused by a small blood vessel (usually an artery) compressing the facial nerve at the brainstem. In rare cases it may be caused by an injury to the nerve, by a vascular malformation, by multiple sclerosis, or by a benign tumor or lesion pressing on the nerve.